2016 Theopolis Vineyards, Pinot Noir, Santa Lucia Highlands. A new wine from Theodora Lee and long time Roar winemaker and Santa Lucia Highlands specialist Ed Kurtzman, the 2016 Santa Lucia Highlands Pinot is a small batch wine, only 110 cases from select sites in the Highlands, and it’s a gem of a Pinot Noir with lush and youthful flavors that showcases the vintage perfectly. This ripe unfiltered and unfined Theopolis SLH Pinot is vibrant and vivid hiding it’s 14.6% alcohol and density very well, in fact this pretty wine, fermented in small bins with gentile handling and aged in 40% 1 year old French oak that gives a hint smoky sweetness and 60% in well seasoned neutral barrels, and it drinks beautiful. 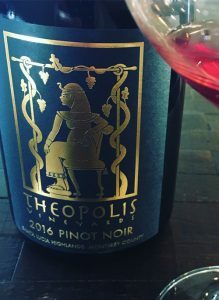 The sultry and soulful Theopolis Vineyard Pinot shines brightly in the glass with a ruby/claret hue and seductive red fruits, snappy spicy notes, subtle earthy elements and ultra smooth/luxurious textures, starting with raspberry, black cherry, wild strawberry and plum fruits, light floral notes, briar/bramble, loam, baking spices, a touch of mocha and liquid rose petals. There’s a lot to like here and this is a winery to watch, I love their Petite Sirah from Theodora’s own estate vineyard best, but the whole lineup is an outstanding set of wines. This wine should gain mouth feel and silkiness over the next year in bottle, but certainly it will be a Pinot you’ll want to enjoy especially in it’s youth, I like it’s juicy lift and open nature, it will be best between 2018 and 2022 and will be a good food wine, in particular ahi tuna tartare, cajun style blackened salmon and earthy mushroom dishes.